For a look that won’t overpower your shower, opt for this elegantly simple Bright Pink Emma Ribbon Trim Shower Curtain framed in grosgrain ribbon for a clean finish. $59. Buy here. 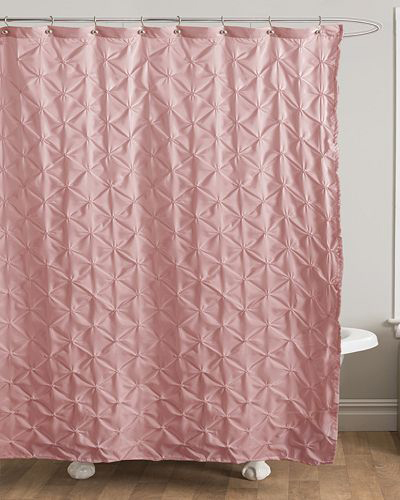 Make it modern with this elegant Lake Como Pink Fabric Shower Curtain featuring an embroidered diamond design. $124.99 Sale $87.49. Free shipping. Buy here. 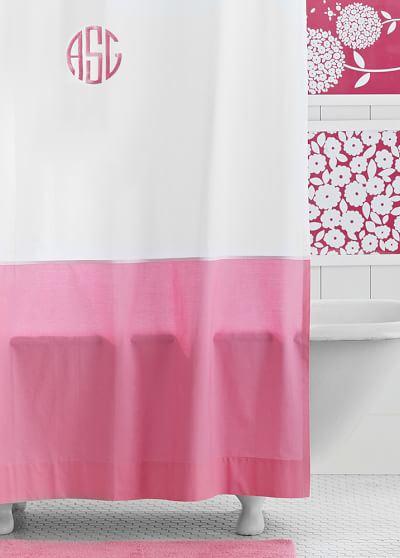 A bold border gives this Pink Classic Border Shower Curtain a classic look that mixes well with other colors and patterns. $59. Buy here. 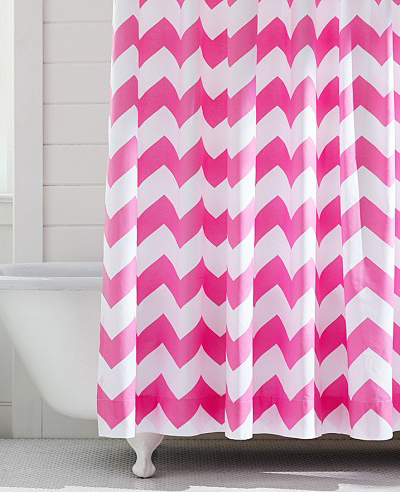 The pleasing zigzag of this Pink Chevron Shower Curtain brightens up the bath. Made of pure cotton canvas. $49.50 Sale $39. Buy here. 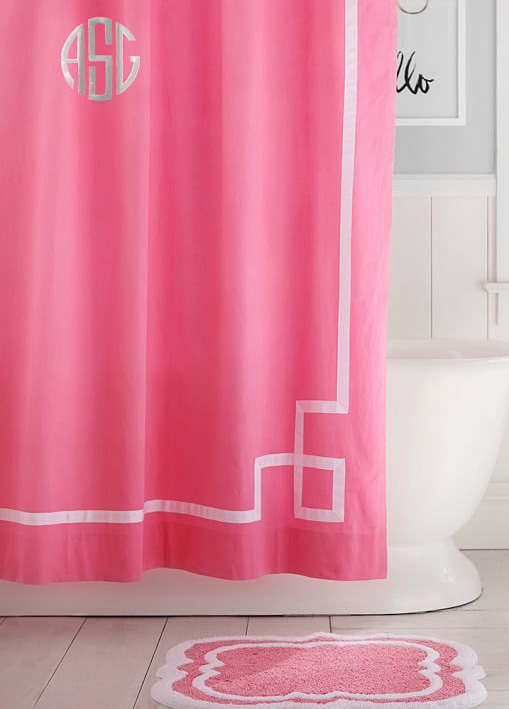 Go contemporary chic with this Lillian Pink Fabric Shower Curtain. Its hand-stitched circles create a fashion-forward look you’ll love. $59.99 Sale $35.99. Buy here. 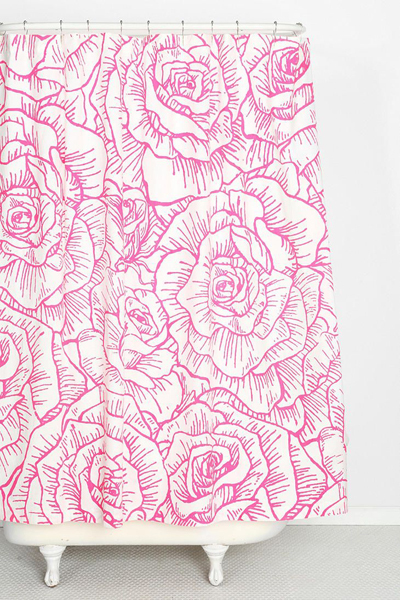 This woven cotton Inked Rose Shower Curtain from Plum & Bow features a bold rose print. $44. Buy here. 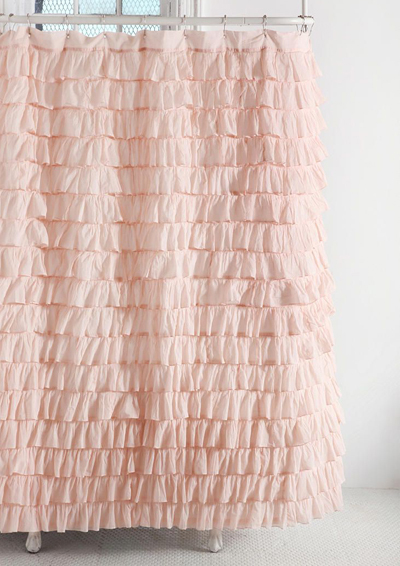 This Pink Waterfall Ruffle Shower Curtain is a romantic shower curtain crafted from cotton and topped with delicate rows of frilly ruffles! Comes complete with reinforced grommets along the top. $79 Sale $59. Free shipping. Buy here. 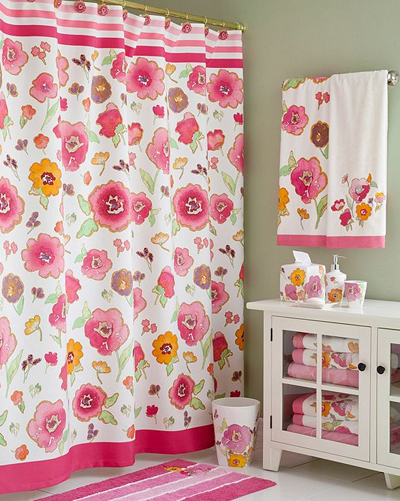 A perfect fusion of a floral motif and a geometric pattern, this Petal Dot Shower Curtain livens up the bath. 72″ square. Made of 100% cotton percale. $59.50 Sale $39. Buy here. 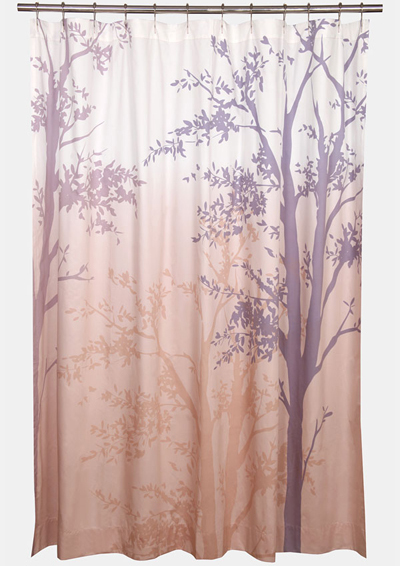 Bring a vista from the outdoors into your bathroom with a limited edition sateen Blissliving Home ‘Amelie Blush’ Shower Curtain enchanted with misty silhouettes illuminated with a sun-kissed glow. Made of cotton. $125. Buy here. Bold, impressionistic florals in a fusion of dazzling colors creates a modern flair in this Lenox Floral Fusion Bath Collection. Bath accessories are made from earthenware. Shower curtain is machine washable. $12-$67. Buy here.